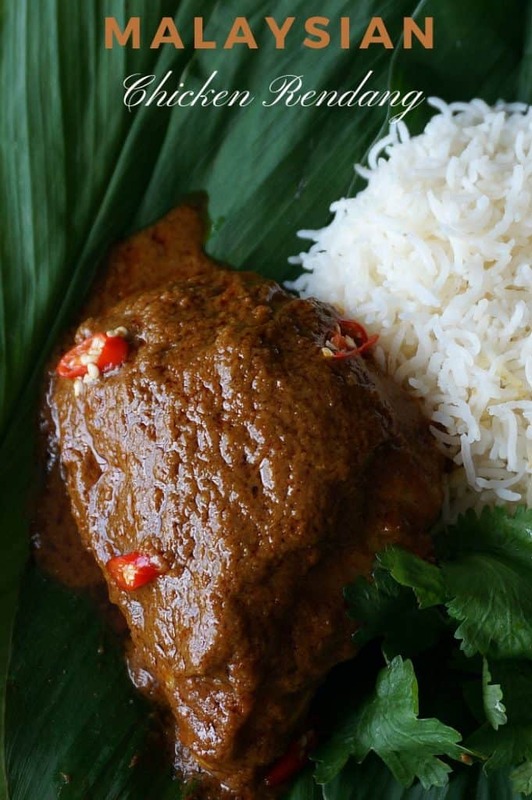 Chicken Rendang is a popular spicy curry dish that we discovered during a recent visit to Malaysia. 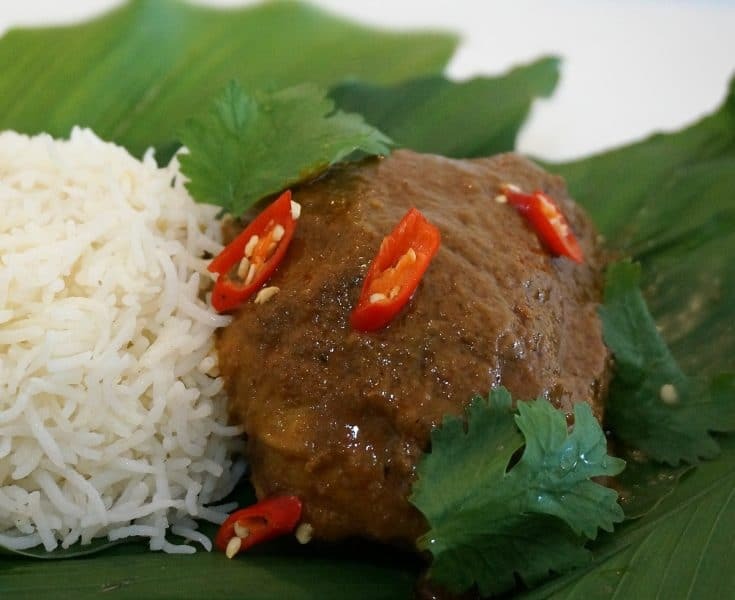 The slow cooked chicken bathed in exotic spices, coconut milk and finished with a dark and nutty coconut paste proved out everything that we had heard about the incredible food of Malaysia. 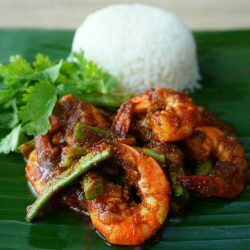 CNN actually put this dish on the top of its list of “50 of the World’s Most Delicious Foods“ Rendang (also often made with other cuts of meat, such as beef or lamb) is often made for special occasions because it does take some time to prepare, particularly if you make the toasted coconut paste yourself. Luckily there are some prepackaged products that are available to use in a pinch. Place the chicken, lime leaves, galangal, lemongrass, tamarind juice, coconut milk, sugar and salt into a pot over medium heat. Continue to simmer for 45 â€“ 60 minutes until the chicken is cooked through and the liquid has reduced and thickened. 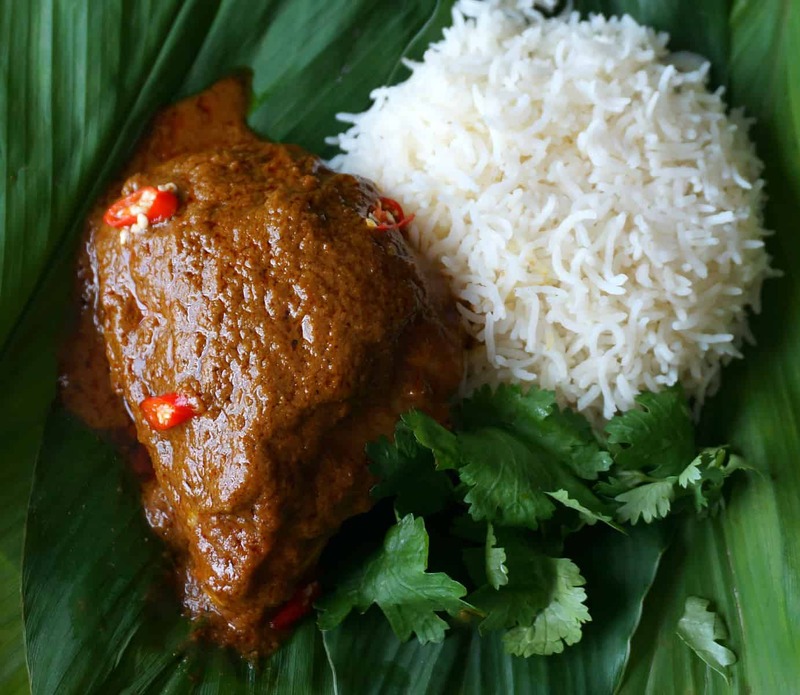 In the mean time, prepare the coconut curry paste. Place 1 cup of shredded unsweetened coconut to a sautÃ© pan or wok over medium heat. Continue to stir until the coconut reaches a rich dark brown color. Place the coconut in a mortar and pestle and grind until it releases its oil and becomes a shiny paste. Or you can grind the coconut in a food processor. Note: To save time, kerisik (toasted coconut paste) which is a staple in Malaysian Cuisine, is also available in Asian specialty stores. Add the coconut paste to the chicken and allow to simmer for another 5 minutes. 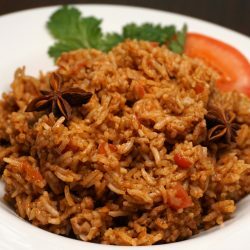 Serve over coconut rice and garnish with traditionally with a hard boiled egg and cucumber slices, or as pictured, with red chile peppers and cilantro. 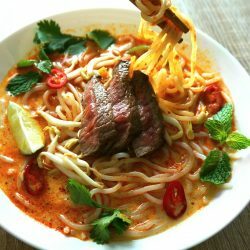 A special thank you to The Tropic Spice Garden who provided us with the basis for this recipe. 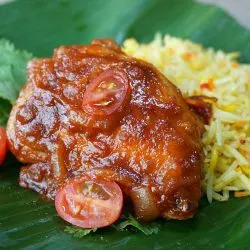 They also have cooking class where you can learn to make this and other wonderful Malaysian dishes.